The summer turned to winter today, or autumn at least, but it is the day after the harvest moon, so perhaps that’s to be expected. One of my favourite and quite underrated autumn/winter vegetables is celeriac. It’s a cultivated version of wild celery, but the part you eat is the root which grows underground and can grow from the size of a large potato up to that of a football. I’d expect that small to medium would give the best flavour and texture. The flavour is, as you’d expect, similar to celery. Celeriac can be used in many ways, such as soups, stews, gratins and my favourite, mashed fried balls. Cut the gnarly skin off the celeriac root and chop it into cubes. Most recipes suggest bringing the cubes to the boil and then simmering for up to 20 minutes, but I’ve found they become tender by about 10 – 15 minutes. You have to test with a fork or sharp knife, in exactly the way you would when boiling potatoes. A lot of recipes also suggest doing the celeriac with potato, but I think that takes a lot of flavour away. Celeriac isn’t expensive and a medium sized one goes a long way. When the celeriac is tender, drain the water and add a knob of butter. You can mash it with a potato masher, but an electric, hand blender/mixer does a better job of mashing it. Add some salt and pepper at this stage too. Celeriac seems to want a lot of salt. 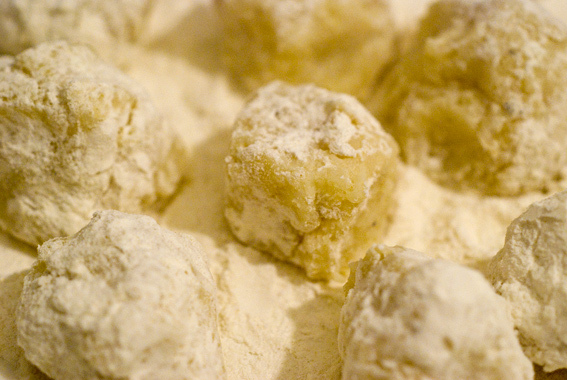 Put a few tablespoons of plain flour into a large bowl, use a dessertspoon to scoop out 1 inch ball size lumps of celeriac and roll them in flour, like my picture. When you have used up your celeriac, add quite a lot of oil to a frying pan and heat it up until the oil is just starting to smoke. The celeriac balls will absorb the oil – you probably want about a quarter of an inch deep (in the frying pan) to start with, but if your pan dries out you can always add more. I’d also recommend using some infused oil, like the rosemary and garlic, I mentioned here, for additional flavour. Fry the celeriac balls in the oil for a few minutes and turn them so that all sides are crispy – they should look like little roast potatoes when done. They can be served with most meat and fish instead of potato. 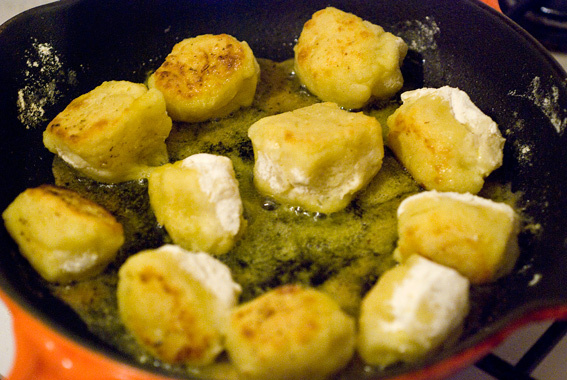 This entry was posted in Recipes and tagged balls, butter, celeriac, flour, fried, olive oil, recipe, salt and pepper. Bookmark the permalink.